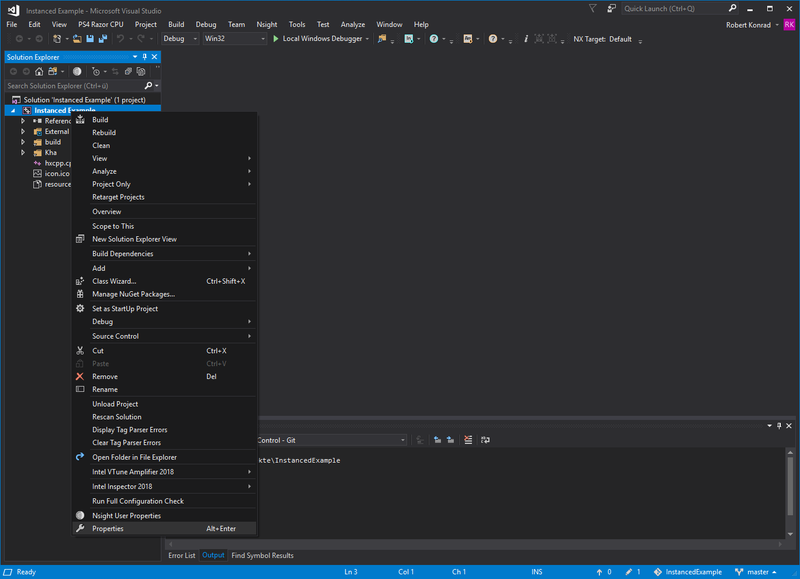 I have Visual Studio Community 2017 installed, and it's telling me the project is incompatible. I'm using github's version of Kha as suggested in another question here. Although, I cloned it using the windows Github Desktop, not through the command line, as the command line one was giving me an error. As far as I can tell, there's nothing wrong with it (all the files seem to be there, including executables, etc). I also tried building the solution manually with Node (version 10.4.0), through the command line, but the result is the same. I tried compiling with Node, and it gives me an error about deprecated functions or something. I don't know if that's relevant for any of this. I have no clue what could be wrong. I'm not sure because you didn't provide the actual error message but I suppose this is about the Windows SDK version which is currently a common problem - the version is set in the Visual Studio project files but the Visual Studio installer by default only installs the latest Windows SDK so it's now common that Visual Studio 2017 installations use wildly different Windows SDK versions. - New Project, "D:\Works\Gamedev\Haxe\Kha\TestProject\build\windows-build\New Project.vcxproj"
- New Project, "D:\Works\Gamedev\Haxe\Kha\TestProject\build\windows-build\New Project.sln"
Ah, that's a different issue - you didn't install Visual Studio's C++ support (aka the C++ project type). 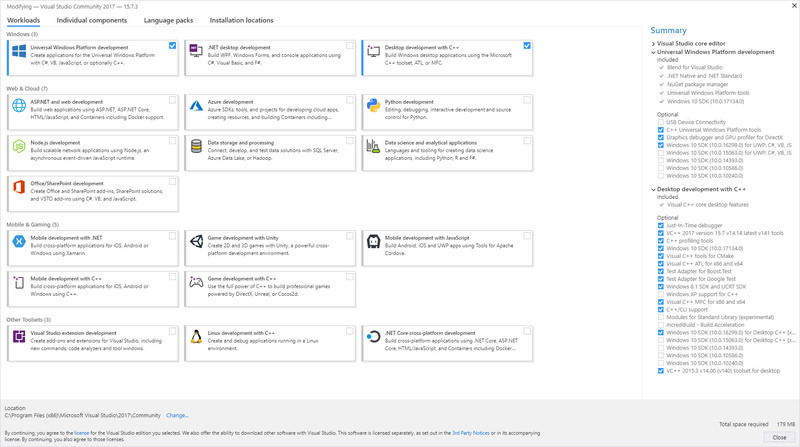 Just run the Visual Studio installer again and select some additional components. I suppose I could've showed this earlier. 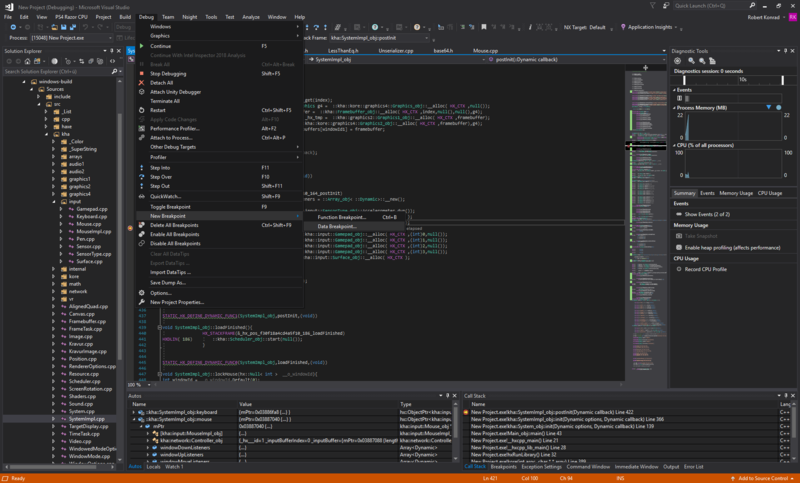 This is how it looks in VS. (I can't access the project's properties by right-clicking). Well, so far this is what I've installed (screenshot below), but it's still not working. I'm gonna try installing the rest of the optional stuff later, to see if it makes a difference. It may be worth noting, I'm on Windows 7. 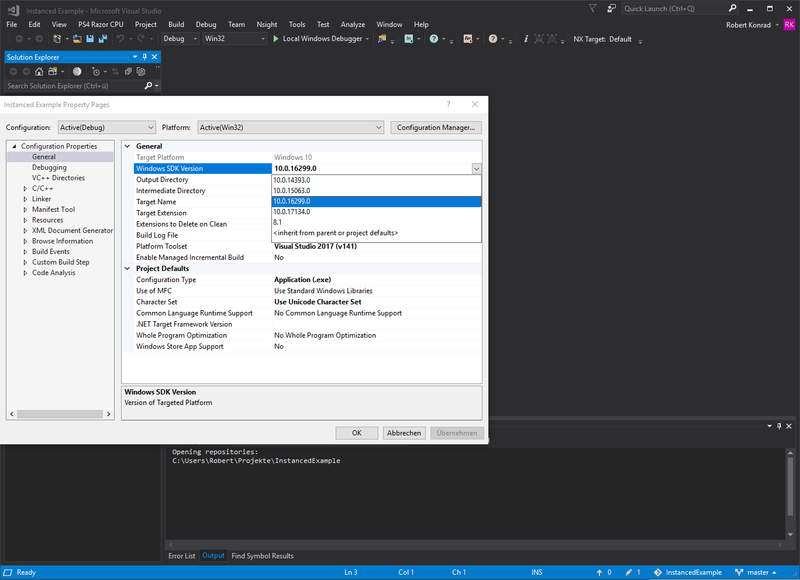 All those SDKs are "Windows 10 SDK..." so I'm wondering if that has anything to do with it. 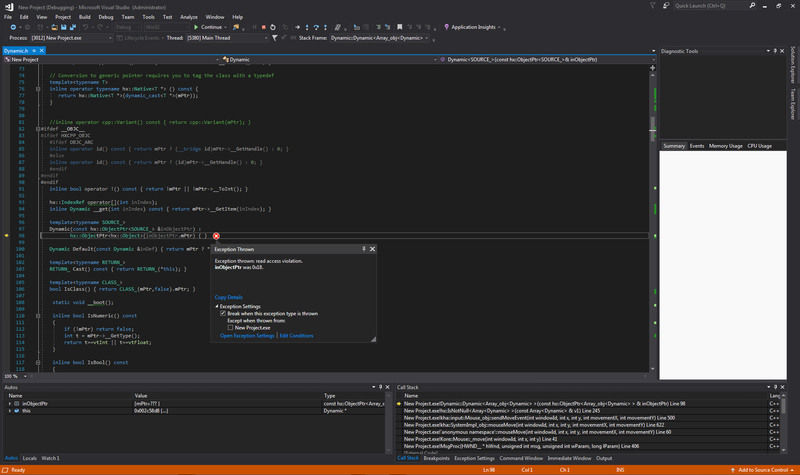 I also wonder if it could work in VS2015. I also have it installed, and I can open the project, it just doesn't build. It gives me a warning as soon as I open the solution: "warning : The build tools for v141 cannot be found. Install v141 to build using the v141 build tools." 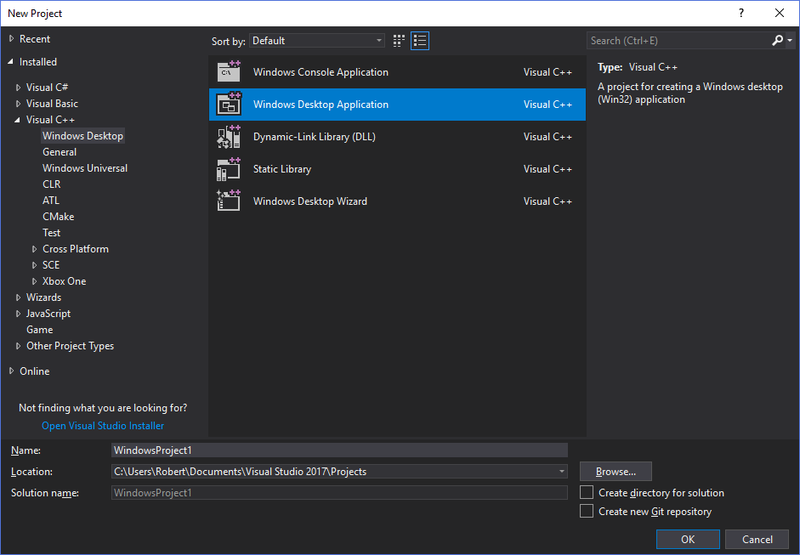 To use VS2015 just build using node Kha/make -v vs2015 (you can also use the --help option to get a list of all options). Well, creating a new project in Kode and compiling again worked. Well, almost. As far as compiling goes, it compiled the whole thing inside Kode, which is more than I was expecting, with no errors and only this warning: "c:\kha\backends\kore\khacpp\src\hx\hash.h(517): warning C4390: ';': empty controlled statement found; is this the intent?" Something is reading a null pointer. What are script errors? Default Kha project, does that mean you just did a Kha init and compiled that? 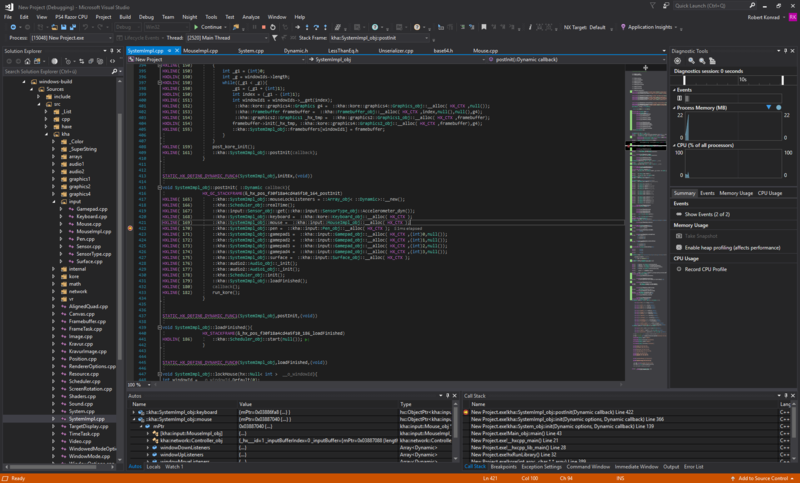 Yes, I just created a Kha project and compiled it immediately (for Windows, not Windows Universal). It works fine in HTML5, both debug and release. A blank (black) window pops up no problem when I run it. I also tried reverting Kode to use its own version of Kha, and that also seems to work now, although it can't compile only because I didn't install the SDK version it requires. I'll try that one later to see what happens. About the script errors, I just noticed they're VS related, and probably irrelevant. The same error dialogue boxes popped up when I closed the solution, and they also pop up when I debug a simple Desktop Application (not Kha related). I did that as you suggested earlier, to test if I could create and build a Desktop App, and it worked fine; compiled and ran no problem at all. So I'm guessing the script errors are related to certain web-like elements in VS, both in the diagnostic tools and its "Start Page". As you can see in my previous screenshot, there's a white blank area in the diagnostic tools panel, which shouldn't be blank. I didn't edit that out, it's really looking like that. I had noticed this on VS2015 before, but VS2015 told me to install an updated version of Internet Explorer in order for it to be able to display some information there. I couldn't be bothered doing that. But anyway, since the errors also happen when debugging an unrelated Desktop App, and that one still compiles and runs fine, I'm guessing they're actually irrelevant. Yes, I think those script errors are unrelated. But I can not reproduce your crash and have no idea what's going on. I'll have to send you some instructions for how to set a data breakpoint when I'm back from work (in ~6 hours). I'm not sure if by "data breakpoint" you mean the usual breakpoints we can set for the debugger, but I do know how to work with the debugger to an extent. Perhaps I could try to follow the execution from the start, and find where that problem comes from, at least. EDIT: Actually, on a glance I'm not sure where to set breakpoints... I set one at the very start of main.cpp (at the #include <hxcpp.h>), but that breakpoint wasn't even reached before the crash. "SystemImpl.hx:350: Could not initialize WebGL 2, falling back to WebGL." Also, now that I'm thinking about it, I had problems with Lime in the past that I never got to sort out, that made it stop being able to compile haxe/openfl to c++. I think that was related to my windows being screwed up and screwing up Haxe for me. So maybe it can also be something to do with my Haxe installation. I'll see if I can figure something out on that end. "AL lib: (EE) ALCmmdevPlayback_open: Device init failed: 0x80070490"
I'm gonna send the Kha project's executable to a friend of mine to see if it runs on his PC. If it does, then I guess that's the problem. My friend just told me it works fine on his end. So I guess that's it. So that means Kha windows' apps crash if there's no sound card. Not sure if that's useful information for you, but there you go. Thanks so much for all the help and for your time, man. Seriously appreciated. Find SystemImpl.cpp (see the file tree on the left side) and set a regular breakpoint at line 422 (one line below the mouse initialization). Then run the program until the breakpoint it hit. Data breakpoints are created using the menu like so. Put in &::kha::SystemImpl_obj::mouse.mPtr, hit ok and then continue to run the program. Hopefully at some point it should hit that breakpoint. Hmm... I did that but when I press OK (in the New Data Breakpoint box) nothing seems to happen. Shouldn't there be an indicator somewhere, showing that there's a data breakpoint there? I noticed it shows up in the "breakpoints" tab. EDIT: I'm trying to see if I can click ok in the error message, actually. That's probably why it's stuck there. But it seems to want to stay hidden after VS gets in front of it. That's unfortunate but I'm out of ideas right now. I'm not being able to click ok in the error when running it from inside VS. I don't know where's the main entry point of the whole program, but I could try inserting a system("pause") there, just so it halts it, so that I can attach the debugger to the process manually, set the breakpoint, then let it continue from there and see what happens. Not sure this trick would work with your code... I used it in the past while doing some simple SDL projects in C.
Just thinking it might help in letting me click ok on that thing. I'm trying to do this because, when I run it manually (outside VS), after I click ok in error, it seems like it closes the app as normal rather than actually crashing. If I can click ok fast enough; if not it crashes. Use the search functionality and look for WinMain.